Double LP version. LPs pressed on premium audiophile-quality vinyl at RTI from Kevin Gray Lacquers; Presented in a textured gatefold Stoughton "laserdisc" jacket with a cover painting by Lisa Alvarado. Jackets, retro-audiophile sleeves and record labels hand-screen printed by Alan Sherry at Siwa Studios, Northern New Mexico. 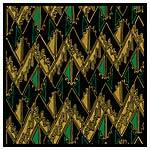 Mandatory Reality, the new album by Joshua Abrams and Natural Information Society, is here. Setting aside (for the moment) the electric instrumentation of Simultonality (GB 048CD/MTE 068LP, 2017) and Magnetoception (MTE 063-64LP, 2015), Joshua Abrams conceived Mandatory Reality for an eight-piece acoustic manifestation of NIS, consisting of himself on guimbri, Lisa Alvarado on harmonium and gongs, Mikel Avery on tam-tam and gongs, Ben Boye on autoharp and piano, Hamid Drake on tabla and tar, Ben Lamar Gay on cornet, Nick Mazzarella on alto saxophone, and Jason Stein on bass clarinet. 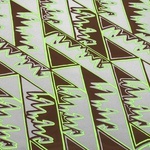 A double album, Mandatory Reality is comprised largely of two performances, both Joshua Abrams compositions, 24- and 40-minutes in length. While new to the band's records, long duration pieces are familiar to those who've heard Joshua Abram and NIS in concert in recent years, where elaboration on a single composition for an hour or more is not unusual. Gradual tempos dominate Mandatory Reality. Recorded two months before the 2017 solar eclipse, Mandatory Reality is the sound of Joshua Abrams and NIS taking its time. Merging methodical compositions with sonically voluptuous orchestration, Abrams heightens the immersive and hypnotic qualities Abram and NIS music is known for, taking the band and the listener deep into a collective meditative space. A grand realization of long-form psychedelic music, Mandatory Reality is a dispatch from a sound world that is increasingly unique to itself. All performances on Mandatory Reality are full takes recorded live to tape by the full ensemble, magnificently captured by Greg Norman at electrical audio, Chicago -- the first true "audiophile" recording of Joshua Abrams and NIS. Mastered by Helge Sten at Audio Virus, Oslo. Mandatory Reality, the new album by Joshua Abrams and Natural Information Society, is here. Setting aside (for the moment) the electric instrumentation of Simultonality (GB 048CD/MTE 068LP, 2017) and Magnetoception (MTE 063-64LP, 2015), Joshua Abrams conceived Mandatory Reality for an eight-piece acoustic manifestation of NIS, consisting of himself on guimbri, Lisa Alvarado on harmonium and gongs, Mikel Avery on tam-tam and gongs, Ben Boye on autoharp and piano, Hamid Drake on tabla and tar, Ben Lamar Gay on cornet, Nick Mazzarella on alto saxophone, and Jason Stein on bass clarinet. 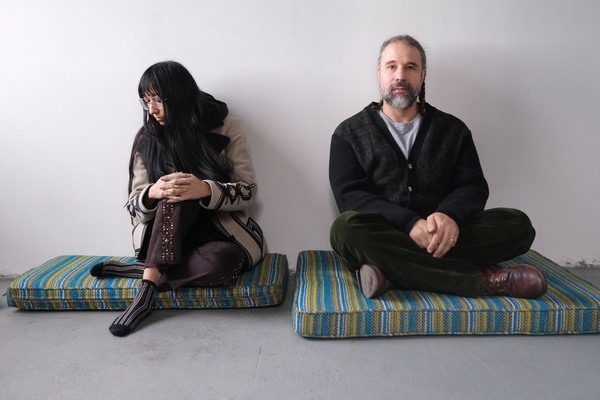 A double album, Mandatory Reality is comprised largely of two performances, both Joshua Abrams compositions, 24- and 40-minutes in length. While new to the band's records, long duration pieces are familiar to those who've heard Joshua Abram and NIS in concert in recent years, where elaboration on a single composition for an hour or more is not unusual. Gradual tempos dominate Mandatory Reality. Recorded two months before the 2017 solar eclipse, Mandatory Reality is the sound of Joshua Abrams and NIS taking its time. Merging methodical compositions with sonically voluptuous orchestration, Abrams heightens the immersive and hypnotic qualities Abram and NIS music is known for, taking the band and the listener deep into a collective meditative space. A grand realization of long-form psychedelic music, Mandatory Reality is a dispatch from a sound world that is increasingly unique to itself. All performances on Mandatory Reality are full takes recorded live to tape by the full ensemble, magnificently captured by Greg Norman at electrical audio, Chicago -- the first true "audiophile" recording of Joshua Abrams and NIS. Mastered by Helge Sten at Audio Virus, Oslo. Cover painting by Lisa Alvarado. Jackets, retro-audiophile sleeves and record labels hand-screen printed by Alan Sherry at Siwa Studios, Northern New Mexico. Repressed. CD release of the follow-up to Joshua Abrams's critically acclaimed 2015 album Magnetoception. Credited to Joshua Abrams & Natural Information Society (NIS), this the first recording in the project's four-album history made by a regularly gigging manifestation rather than a special assembly of friends. Recorded in 2014 and 2015 in single takes by the full ensemble during and after tours of the U.S. and Canada, Simultonality once more affirms the project's unique approach to joining traditional musics, American minimalism, and jazz with the Gnawa ceremonial instrument the guimbri. Stasis, continuity, and repetition -- central qualities of Abrams's language -- defined Magnetoception, a double album of beautifully spacious and unhurried music that rated high on both Pitchfork's "Experimental Records Roundup" and The Wire's "Releases of the Year" at the end of 2015. These same qualities form the heart of Abrams's music on Simultonality. But while Abrams once said Magnetoception is about "winter & death," Simultonality, in Abrams's words, is an album of "pure motion." Without sounding frenetic it is the most explosive NIS music on record, and without sounding over-determined it is Abrams's most structured and thru-composed music yet. Much of it is also fast ("the last record was slow"), a mass of densely patterned elements swiftly orbiting constantly reconfiguring centers that are variously harmonic and rhythmic, clearly stated or implied. While so teeming and tightly packed as to sometimes seem impossible to parse, the music is at no time any more disorderly than a colony of bees pollinating a vast garden. Its many moving parts function in a mutualistic relationship toward fulfilling Abrams's long-stated intention for the project: to help listeners achieve a meditative center and to consciously use music as a gateway to living. Abrams credits the great bassist and composer William Parker as an inspiration for this intention. The musicians on Simultonality date back to the nascency of NIS. Along with Hamid Drake, Mikel Avery and Frank Rosaly are Abrams's first-call drummers for the project. Abrams prefers two or more drummers in NIS whenever possible. On Simultonality, Avery is in the left channel, Rosaly the right. The metallic shaker sound sometimes heard in the center of the stereo image is the rattle attached to Abrams's guimbri. Astute heads may recognize the rhythm in "Sideways Fall" as Jaki Liebezeit's drum break from Can's "Vitamin C." At Abrams's behest the two drummers divided the beat into separate parts. According to Hamid Drake the rhythm was popularized, if not originated, by John "Jabo" Starks and Clyde Stubblefield of The J.B.'s. Nearly ten years into an existence that began in 2008, Abrams and the NIS wear their influences with creativity and ease. Longstanding NIS members Ben Boye and Emmett Kelly were previously together with Abrams, or not, in Bonnie Prince Billy's band, and Abrams and Boye have at different times played in Kelly's band The Cairo Gang (while Boye and Kelly are in Ty Segall's Freedom Band as of 2017). Harmonium player Lisa Alvarado also contributes the large-format pattern paintings used by NIS at concerts and for its album covers.